The prison experience generally adds to that accumulation. People's capacity to function in the community, including their parenting capacity, is weakened. Their children grow up with a bigger bundle of risk factors than their parents. In this way prisons are at the centre of an inter-generational spiral of disadvantage and dys–function. In blunt terms, the more people who have experienced the standard prison the more will end up in prison in the future. Aus–tralia's prison population has been growing at an average of 5 per cent a year since 1984.The biggest challenge for the ACT is to see that the mental health of those who emerge from its new prison is better or at least no worse than when they entered. Based on surveys of prisoners in NSW, it can be expected that ACT Corrections will have to cater for the 80 per cent of men and 90 per cent of women who will have experienced a major mental health disorder in the previous 12 months. Thirty-four per cent of women will have had an affective disorder like depression. The same percentage of men will have had an anxiety disorder; 40 per cent of men and 57 per cent of women will have had a personality disorder. To cap all this off, 64 per cent of men and 75 per cent of women will have a substance use problem - overwhelmingly, dependence on an illicit substance rather than alcohol. Yes, sustance abuse and dependence are recognised as major mental health disorders. The correlation between prison, drug dependence and other mental health disorders is no conci–dence. The rate of those with even severe mental illnesses like schizo–phrenia becoming mixed up in the criminal justice system is only slightly greater than the general population. The rate jumps through the roof when substance dependence is added to the mix. A big driver in the remorseless rise in the prison population is the fact that more and more people with other mental health problems are adding substance dependence. The Government is committed to the prison being rehabilitative. If this is to be more than a pious wish, steps must be taken both in prison and after people leave to minimise recognised risk factors injurious to mental well-being. Within the prison there are barriers to people accessing the mental health treatment that is available. In the words of a prison psychiatrist, "Those who do seek mental health treatment are at risk of being seen by staff as attempting to evade the rigours of prison, and by fellow prisoners as weak and unacceptably alien." Somehow prison must compen–sate for the sudden loss of factors protective of mental well-being like beneficial social and family support. Strip searching is a com–mon practice. The Human Rights Commission found that a detainee on remand could expect about 10 such searches a week. This degrading practice can retraumatise the many women in prison who have experienced sexual abuse. In a Queensland prison survey, 37 per cent of women reported sexual abuse prior to the age of 16. Concern about radiation severely limits the use of X-ray scanners as a substitute for strip searches. Seclusion is also pervasive in the standard prison. It commences with the 14∏ hours a day that remand prisoners presently spend in their cells. It can expand for any number of reasons, including unscheduled lock-downs. 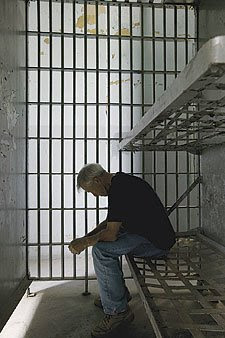 Separation and seclusion are all too often applied to troublesome prisoners who have a mental disorder. Suicide can be prevented by placing someone threatening self–harm under surveillance in a bare cell devoid of hanging points. This is the reverse of therapeutic - human interaction is a key element in suicide prevention. Self-harm may be prevented in prison but not after release. A NSW study published last year found that the suicide rate for men was 3.87 times higher in the two weeks after release than after six months. Then there are overdose deaths. Strip searching is just one of the draconian steps taken in the vain attempt to keep drugs out of prisons. In disregard of addiction being a chronic relapsing condition, prisons place a premium on abstinence. In many cases abstinence is achieved, only for the person, now with reduced tolerance to the drug, dying from an overdose upon relapsing after release. None of these mental health problems is insoluble. All we need to do is to deploy the knowledge we already have. The challenge is to change a mind set. Bill Bush is secretary of the ACT Community Coalition on Corrections. He helped write its study "Healthy or harmful? Mental health and the operational regime of the new ACT prison" launched this week.